63 Commonwealth is located on the north side of Commonwealth, between Berkeley and Clarendon, with 61 Commonwealth to the east and 65 Commonwealth to the west. 63 Commonwealth was designed by Snell and Gregerson, architects, and built in 1877 by Webster & Dixon, builders, one of two contiguous houses (63-65 Commonwealth) designed by Snell and Gregerson and built at the same time but by different builders. 63 Commonwealth was built as the home of Mrs. Anna Caspar (Crowninshield) Warren, the widow of Dr. Jonathan Mason Warren, a physician and surgeon. She previously had lived at 2 Park Street. She is shown as the owner on the original building permit application for 63 Commonwealth, dated July 11, 1877, and on the final inspection report, dated August 30, 1878. Anna Warren purchased the land for 63 Commonwealth on April 10, 1877, from the estate of Caroline S. (Amory) Eckley, the widow of David Eckley. It had been purchased from the Commonwealth of Massachusetts on March 6, 1863, by attorney Edward Ingersoll Browne as her trustee; she died in June of 1866. Click here for an index to the deeds for 63 Commonwealth. On July 12, 1893, Anna Warren transferred 63 Commonwealth to her son, Dr. John Collins Warren, and Francis C. Welch, as trustees on her behalf. She continued to live at 63 Commonwealth until her death in February of 1905. On April 25, 1905, 63 Commonwealth was acquired from Anna Warren’s estate, trustees, and heirs by her son, John Collins Warren, and his wife, Amy (Shaw) Warren. They lived at 58 Beacon, where he also maintained his medical office. On August 29, 1905, 63 Commonwealth was purchased from J. Collins Warren and Amy Warren by Sarah (Sallie) Blake (Austin) Rice, the wife of retired cotton manufacturer Francis Blake Rice. They previously had lived at 454 Beacon. Their daughter, Gertrude Major (Rice,) Lawrence had married to Amory Appleton Lawrence in June of 1900, and they lived next door, at 61 Commonwealth. She died in February of 1907. Francis Rice died in May of 1913. Sallie Rice continued to live at 63 Commonwealth and, during the 1914-1915 winter season, was joined by Henry Cannon Clark, a broker and later a publisher, and his wife, Mary Lovering (Head) Russell Clark. Their primary residence was in Prides Crossing. 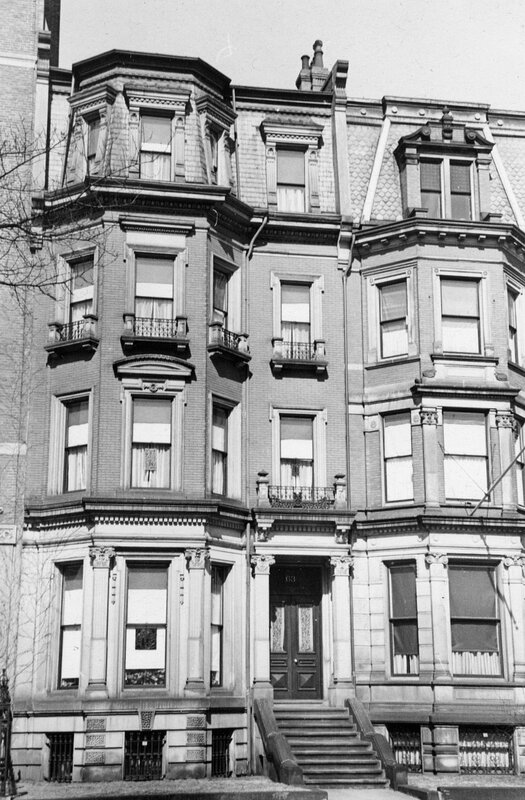 Sallie Rice continued to live at 63 Commonwealth during the 1916-1917 winter season, but moved soon thereafter and by the 1917-1918 season was living at 62 Beacon. 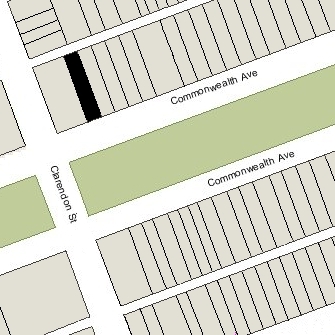 63 Commonwealth was not listed in the 1917 Blue Book. During the 1917-1918 winter season, 63 Commonwealth was the home of George Baty Blake and his wife, Margaret Fassitt (Hunnewell) Blake. Their primary residence was their home, Pine Needles, in Lenox. 63 Commonwealth was not listed in the 1919 Blue Book. During the 1919-1920 winter season, 63 Commonwealth was the home of Major General Clarence Ransom Edwards and his wife, Bessie Rochester (Porter) Edwards. General Edwards was in command of the US Army’s Northeastern Department, having returned in late 1918 from France, where he had commanded the 26th Division. In September, the Edwardses moved to Camp Taylor in Kentucky, where he was placed in command of the 2nd Brigade. On June 14, 1920, Sallie Rice transferred 63 Commonwealth to her son, George Tilly Rice, a banker and note broker. He and his wife, Margaret Forbes (Perkins) Rice, lived in Westwood. He died in September of 1920. During the 1920-1921 winter season, 63 Commonwealth was the home of department store heir Harold Leufroi Chalifoux and his wife, Elizabeth Alice (Burrage) Chalifoux, who also maintained a home in Beverly. They had lived at 342 Beacon in 1920. On August 3, 1921, 63 Commonwealth was purchased from the estate of George T. Rice by Mary J. (Mahoney) Donnelly, the wife of Edward Calvin Donnelly. Harold and Elizabeth Chalifoux continued to live at 63 Commonwealth during the 1921-1922 winter season, but had moved to 175 Beacon by the next season. By the 1923-1924 winter season, 63 Commonwealth had become Edward and Mary Donnelly’s home. They previously had lived in Dedham. They also maintained a home at Beach Island in Cohasset. Edward Donnelly died in January of 1927. Mary Donnelly continued to live at 63 Commonwealth and to maintain homes in Cohasset and Dover. Their four children — Mary Aline (Mayline) Donnelly, Edward Calvin Donnelly, Jr., John Donnelly, and Catherine Donnelly — lived with her. Edward Donnelly, Jr., who had succeeded his father as head of Donnelly & Sons, married in June of 1935 to Mary Curley, the only daughter of Boston Mayor and Massachusetts Governor James Michael Curley. 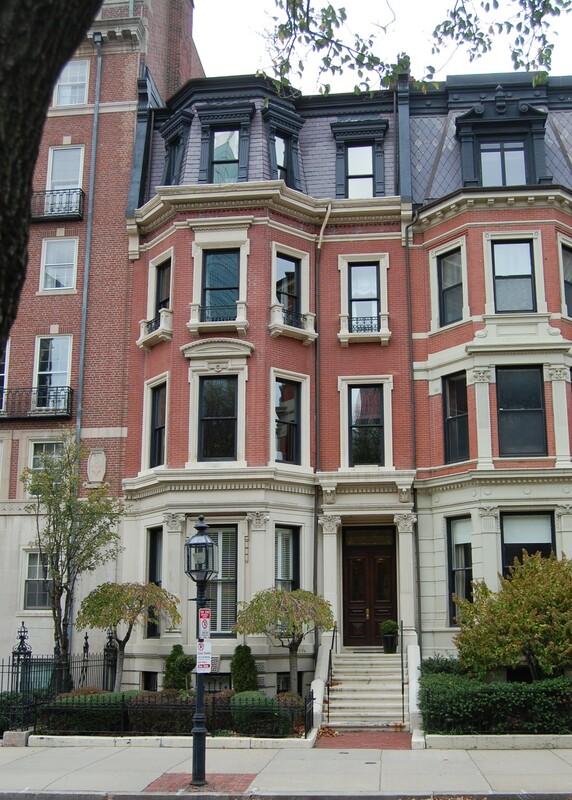 After their marriage, Edward and Mary Donnelly lived in an apartment at 250 Beacon, then briefly (in 1936) with his mother at 63 Commonwealth, and then in Medfield. John Donnelly, a manager with Donnelly & Sons, married in October of 1936 to Alicia Timulty. After their marriage, they lived in an apartment at 250 Beacon. 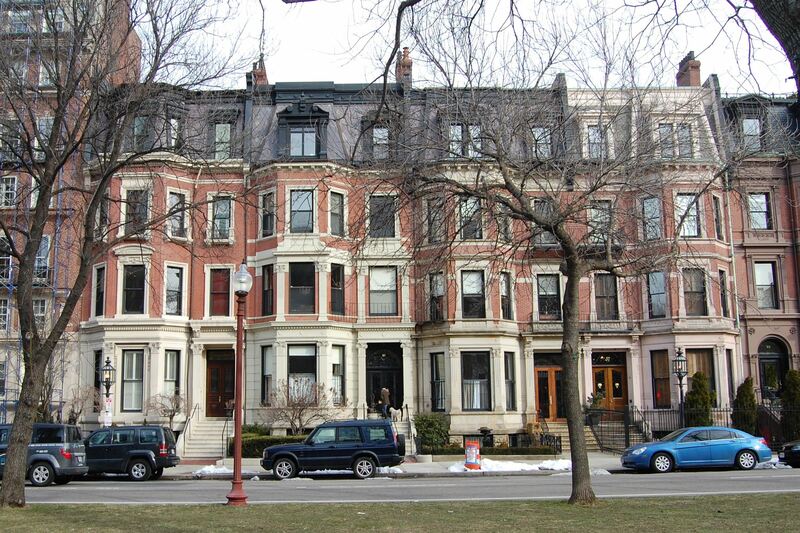 Mary Donnelly and her unmarried daughters, Mayline and Catherine, continued to live at 63 Commonwealth. Mayline Donnelly married in January of 1951 to Raymond Thomas Stuart, a real estate executive. His first wife, Marguerite Frances Mahoney, had died in September of 1947; she was the sister of Mary (Mahoney) Donnelly and Mayline had been a flower girl at their wedding in 1918. Catherine Donnelly died in August of 1953 and Mary (Mahoney) Donnelly died in July of 1957. On June 1, 1961, 63 Commonwealth was acquired from Mayline (Donnelly) Stuart by Chamberlayne School and Chamberlayne Junior College. In July of 1961, Chamberlayne filed for (and subsequently received) permission to remodel the house from a single-family dwelling into a dormitory. Chamberlayne went bankrupt in the mid-1970s, and on January 16, 1975, 63 Commonwealth was acquired by James R. Holland and his wife, Helen Devine Holland. 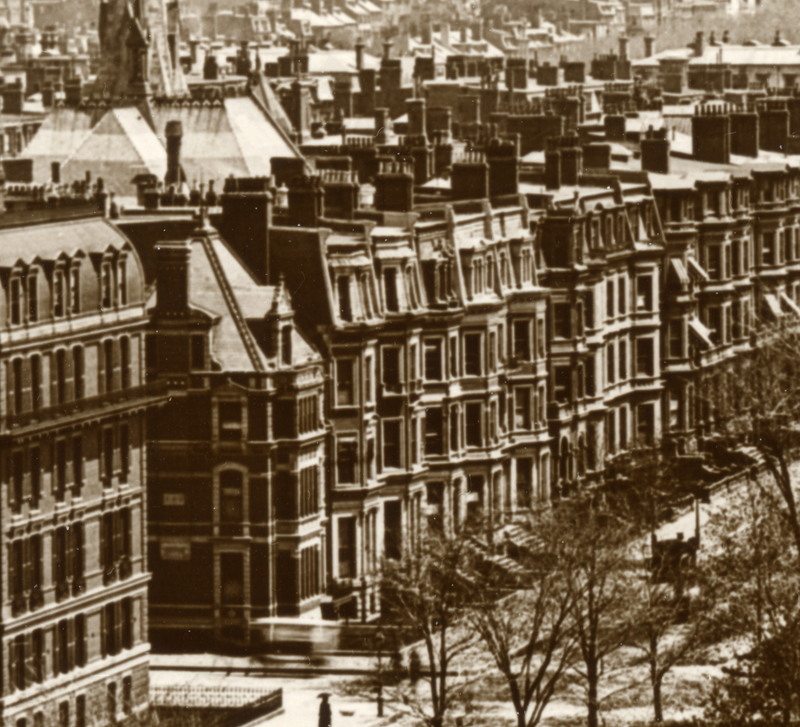 In February of 1975, the Hollands filed for (and subsequently received) permission to convert 63 Commonwealth from a dormitory to seven apartments. On August 31, 1984, they converted the apartments into seven condominium units, the Holland House Condominium. By 1999, all seven condominiums had been acquired by Lynne J. Glazer, trustee of the Jellybean Realty Trust. In October of 1999, the trust applied for (and subsequently received) permission to convert the property from seven apartments into four apartments, and on November 7, 2000, it converted the building into four condominium units, the VIDAN Condominium.